I've only had my Macbook Pro for two years, but the poor thing was a lemon to begin with, and I've abused it until it coughs like an old Chevy. I got the latest top-of-the-line laptop to replace it today, and since we were in the neighborhood, the new machine and I went to Yossi Milo Gallery to see Pieter Hugo's photo show "Permanent Error" before it closes tomorrow. 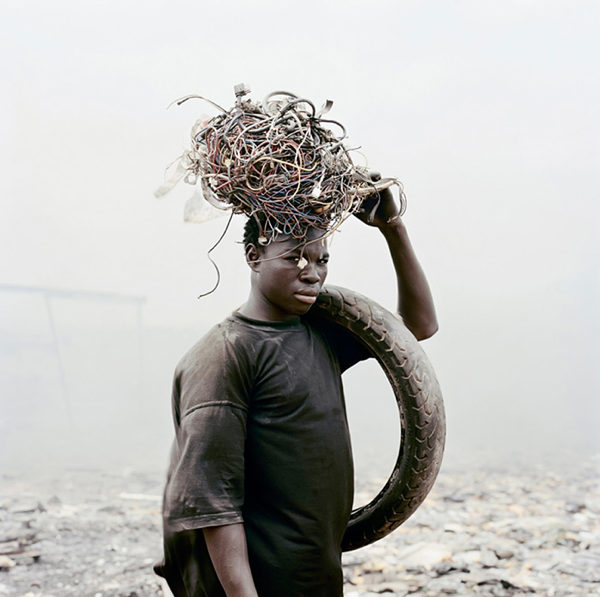 Pieter Hugo documents a dump in Ghana where destitute laborers melt down old computers and monitors for copper, aluminum, and brass. If I understand correctly, the economics works like this: tens of millions of shipping containers come to Europe and the US carrying import goods every year, and since the shipping containers have to return to Africa, China, and the rest of the Third World anyway, it's extremely cheap to ship our electronic trash back. Thus, it's profitable (barely) for these Ghanaians to burn our computers for scrap metal, poisoning themselves and their cities in the process. I read often that I should pay attention to where my electronic trash goes, but nothing has hit home like these photos. This is the peculiar power of images: they trick me into caring. They draw me in with their beauty, and then strike with their sadness. It's a bait-and-switch that works every time. It's why I applaud concerned photographers when they mix fine-art aesthetics with their activist message. There must be another way to employ the poorest people, and there must be another way to recycle our trash. I promise my new Macbook Pro I'll find it a better graveyard when its time comes. More photos in "Permanent Error" by Pieter Hugo.